First things first: Octahedron: Transfixed Edition’s soundtrack is stellar. It's a fusion of crunching basslines and techno breakdowns that marry perfectly with the neon aesthetic that makes every level of this 2D platformer. But it’s more than just a score to keep your head bobbing and your feet tapping. Every track has a BPM that fits the rhythm and flow of the hazards of each level. The result is a fast-paced platformer that’s part Celeste, part Rez and part Guitar Hero. 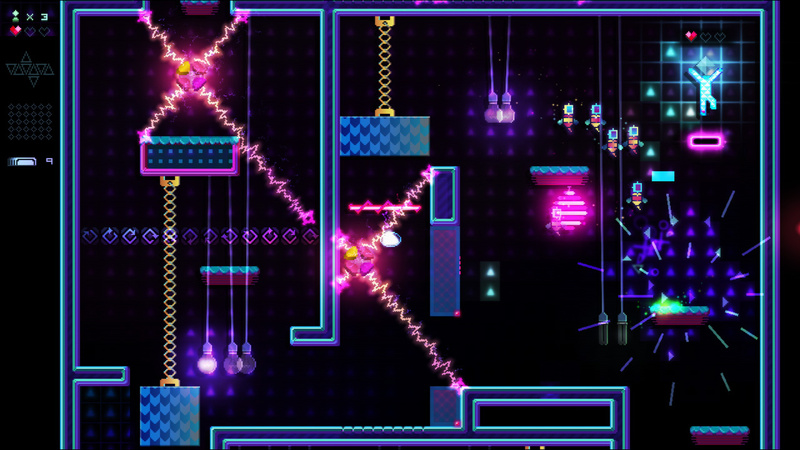 Most of these hyper-fast, consistently challenging twitch platformers have a gameplay gimmick to set it apart and Octahedron doesn’t disappoint in that regard, either. When a man happens upon a glowing shape in the woods, it imbues him with powers and sends him deep into the subterranean underworld of Veetragoul. Now you can create platforms with the touch of a button, enabling you to reach higher platforms as you ascend its 50-plus levels in hope of reaching home. You don’t just use these platforms to climb, but to move as well. Move the left analogue stick in any direction and the platform will move with you. You’re essentially surfing it across the screen, although it will only last so long before it winks out of existence. As you progress through each world, you’ll get a different number of platforms to call on, which reset every time you land on solid ground. But, as you’ve probably already guessed, that’s not even the tip of this neon iceberg. Developer Demimonde wants you to think fast and earn every inch you ascend. Glowing barriers will reset your platform conjuring ability, which can be used to ascend large vertical gaps in a spiral of magical movement, or as a way of covering large distances full of traps and enemies below. You see, most of the time you can’t fight back, but you can use movement, momentum and the scenery itself to overcome each challenge that’s placed before you. Yellow spiders can be avoided if you time your jumps around their patrols. Red boxes that pump out red blobs that circumnavigate entire platforms can sometimes be moved to change the direction of their deadly fire. Enemies that leap up or down when you pass by can be held at bay with the right kind of timing. Even in its first hour, Octahedron continues to roll out new mechanics and ideas as it tests your ability to multitask to the beat. You’re constantly juggling them in different orders, and the pace only gets faster and the windows for success only get smaller the further you progress. Considering every enemy movement is loosely tied to the beat of the track pumping away in the background, the setup of each vertical level has been purposefully built to follow a particular rhythm. With so many games opting for procedural generation, Octahedron's handcrafted levels are finely tuned so that every element has its place in the mix. 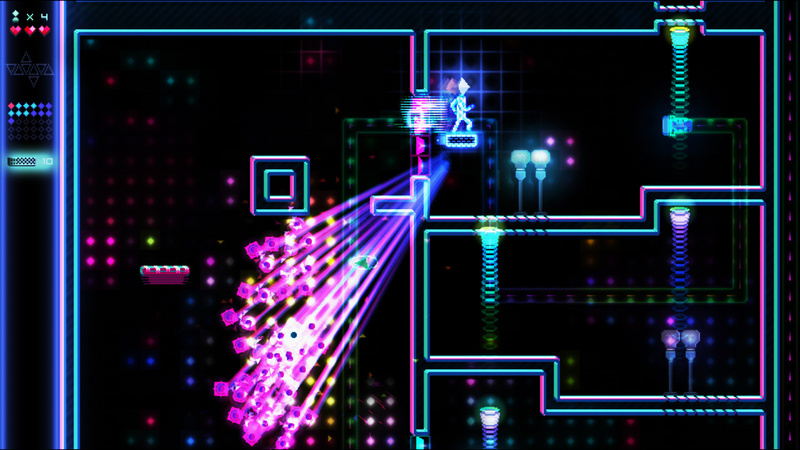 Using your conjured platform, you can attempt to complete each level by destroying light bulbs, which explode with a neon boom and then rise to form flowers on a platform above. 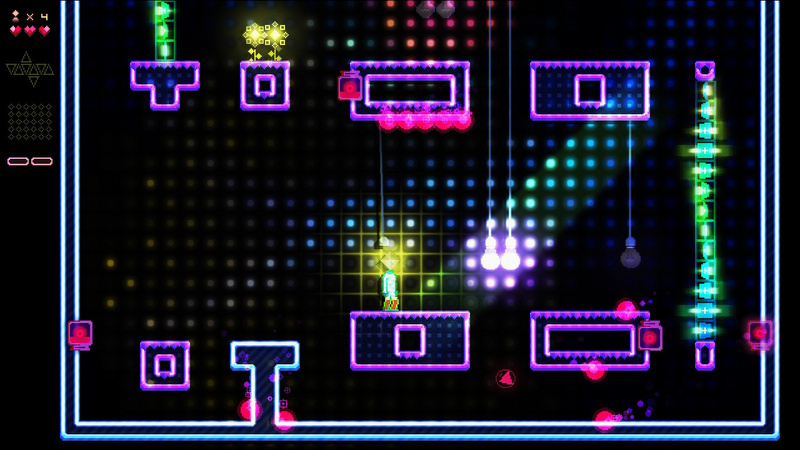 There are even floating triangles that explode with colour and light when you find a way to reach them. These contribute to a final score that will eventually unlock further worlds to explore. Push further and you’ll unlock more platforms that have unique properties, such as one that sends a downward blast of energy as you surf it (perfect for clearing the considerable number of enemies present in the latter worlds and their levels). You can use a series of pipes to ride through to different pipes in a level like a surge of data travelling along a cable. Octahedron is constantly throwing new ideas at you, and every one of them perfectly suits the next, even when things get considerably intense. And things will get intense. Chaos is part of the deal, but that black background and pixelated neon visual style mean that when the action ramps up, tracking everything on-screen becomes a fine art in itself. It’s still perfectly playable in handheld/tabletop mode, but we found using the bigger screen real estate of a TV made following your leaping hero while neon fireworks explode at every turn considerably less of an issue. The Transfixed Edition, as par the course with these Switch ‘ultimate edition’ releases, packs in the full game along with some additional medals for the time trial mode (where clearing levels as fast as possible is the name of the game) and plenty of extra challenges, should the difficulty of its latter stages leave you hungry for more. Octahedron was already a deliciously rewarding platformer when it originally launched in 2017, and now it’s just that little bit better on Nintendo Switch. 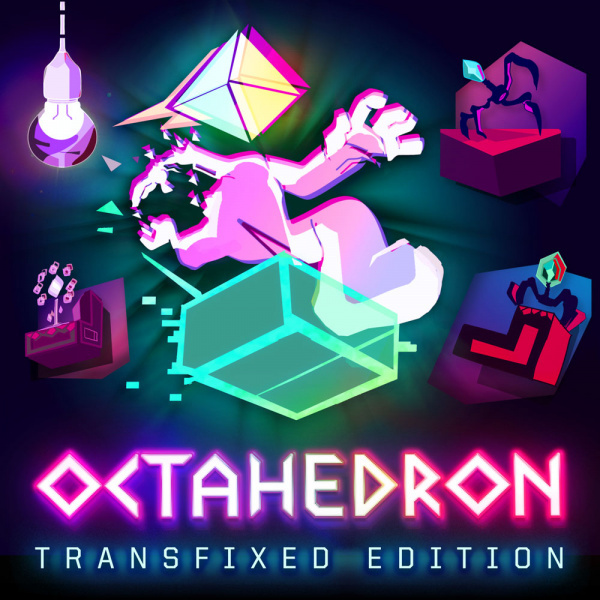 With the purity of its twitch platforming mechanics and the clever way developer Demimonde exploits user-generated platforms, Octahedron: Transfixed Edition certainly lives up to its new subtitle. The soundtrack alone is worth the price of admission – especially if you’re partial to some big EDM beats – and if you’ve ever enjoyed the likes of Downwell, Crypt of the NecroDancer or Celeste, this TRON-loving indie is likely to entrance you. Celeste is easily the best 2D platformer I've ever played so bringing up any sort of comparisons with that is setting the bar rather high. Crypt of the NecroDancer is amazing too. I've never actually heard of this before, and I'm not sure if it's for me yet, but I'll look into it a bit more and decide if I want it. @BenAV There is a free demo of Octahedron on the Switch eShop. Pretty substantial demo, at that. I tried it & it seems to be quite a well-designed, engaging game. I’m personally a bit saturated of puzzle platformers, so I probably won’t get this anytime soon — but thatks more a comment about my particular preferences than the game itself. I can see a certain kind of gamer really enjoying this (including my former self, I suppose). Also, judging from the demo, the music really adds to the experience, in a way seldom seen in platformers. @sfb I took a look at it at the eShop after reading this and did notice the demo there. I usually avoid demos but I might consider trying it or at least watching a bit of gameplay to decide whether to buy it or not. If I'm going to get it, I'd like to get it before the launch sale ends. The one problem with Celeste being so incredible is that it's ruined other platformers for me a little bit, haha. End up just going back to Celeste instead. @BenAV This one gets a FULL recommendation from me, the demo played fantastically and I actually stopped playing it cause I wanted the game to be a surprise when it comes out. I preordered it and I think it's gonna be a blast. I agree about Celeste, that game and Dead Cells have pretty much ruined all other games like this for me but this one stands out. I'd grab it man, I don't think you'll regret it! @Fake-E-Lee Nice one, sounds good. I'll likely give it a chance as it's on the cheap side of things anyway so it won't be breaking the bank but I'll still probably look into it a bit more thoroughly before committing. When its in a sale I get it right away! @BenAV I respect that you might skip the demo. Similarly, I usually avoid watching extensive gameplay before purchasing a game. 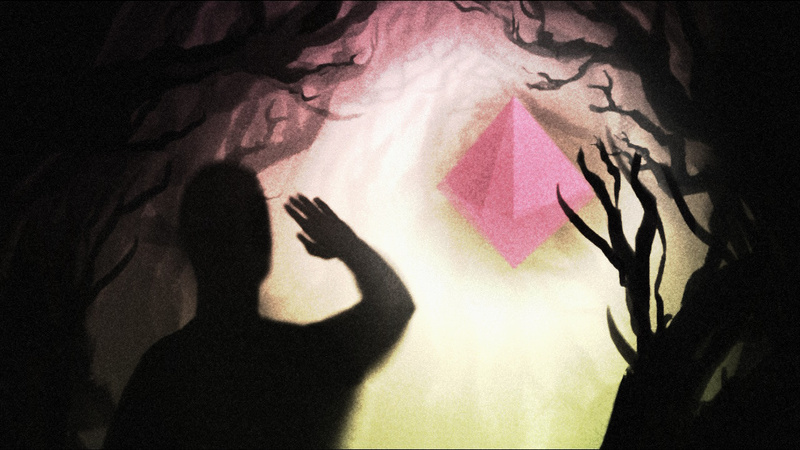 FWIW, I found the “feel” of Octahedron very unusual, based on the demo. The mechanics of the jump felt different than what I’m played in most platformers — and of course the platform creation has its own unique feel. Not necessarily a bad thing, but personally I found it took a bit of getting used to. Again, I can see the game being responsive and fluid after this learning curve — YMMV, of course. This sounds really cool but the visual style is a turn off. I am glad to hear there is a demo so I can try it out. I hope I like it.... My wallet and backlog do not feel the same way though. Never heard of this, but now I'm pretty intrigued! The demo was fun, but it didn't imediately inspire me to download the game. Maybe later?